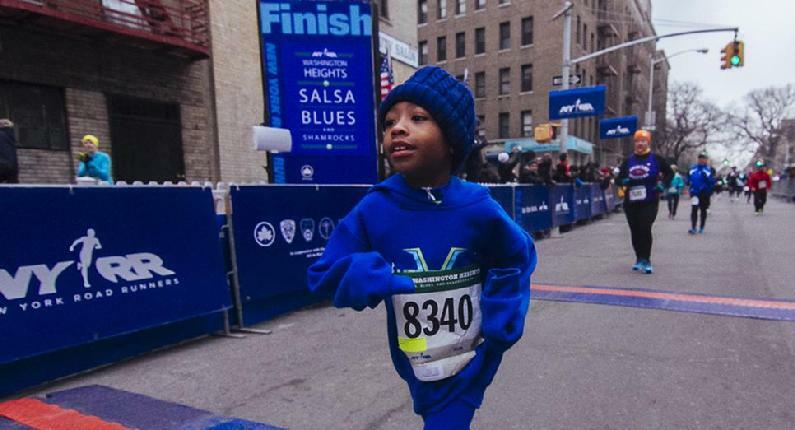 The Blessings continues for Velocity Track Club New York on Sunday, March 2, 2014 at the Washington Heights Salsa, Blues and Shamrocks 5K (3.1 mile) Run that was hosted by the NYRR (New York Road Runners). 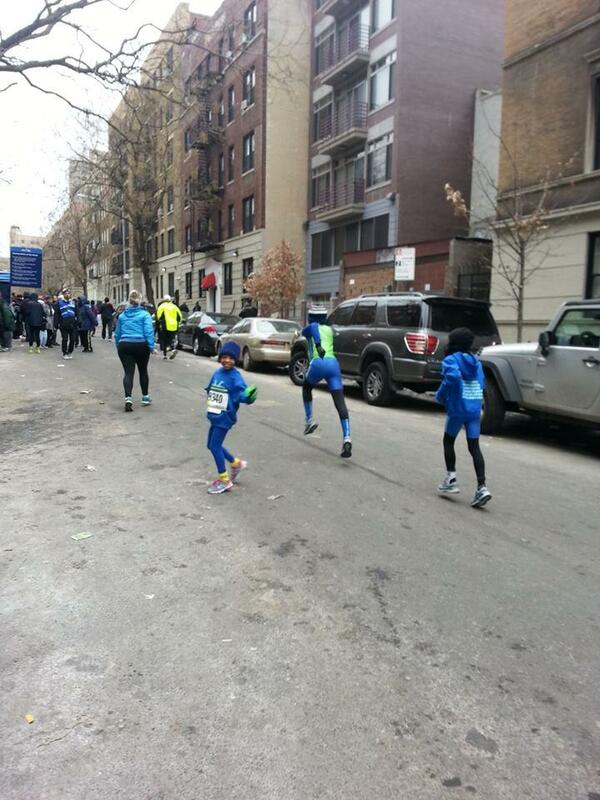 We were excited to participating in this amazing event through the historic Washington Heights and Inwood communities. There were approximately 6,182 (3,105 women & 3,077 men) running and walking the streets from 169th and Fort Washington Avenue. Past the George Washington Bridge at 178th Street and enter Fort Tryon Park. Over the rolling hills of Marganet Corbin Road and back to Fort Washington Avenue to the finish near 170th Street. 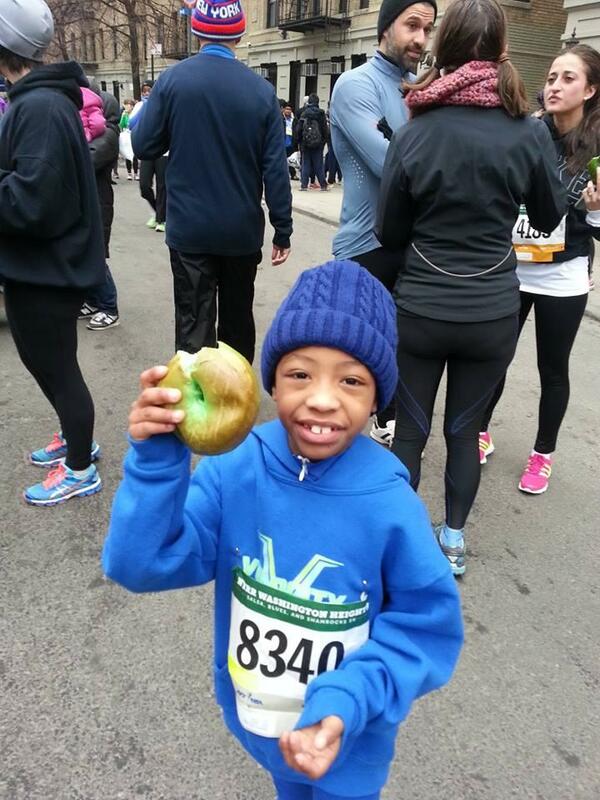 After the 5k run, there were races for children, 12 years and younger, plus they gave all participates t-shirts, green bagels, apples and water. Our student athletes competed in the 5K run, plus the children races. They performed well in both races. Adrian Swift-Henry ran the 5K and was 13th overall for 11 years old and younger boys and showed his sprinting skills with a 2nd place finish in the 400 meter race. Giovanna Tolbert ran the 5K in 23:20 minutes. Giovanna (12 years old) placed in 8th out of 100 girls in the 1 � 14 age division and was the 2nd 12 years and younger girl to finish. Then she won the 400 meter 11 & 12 age division race. 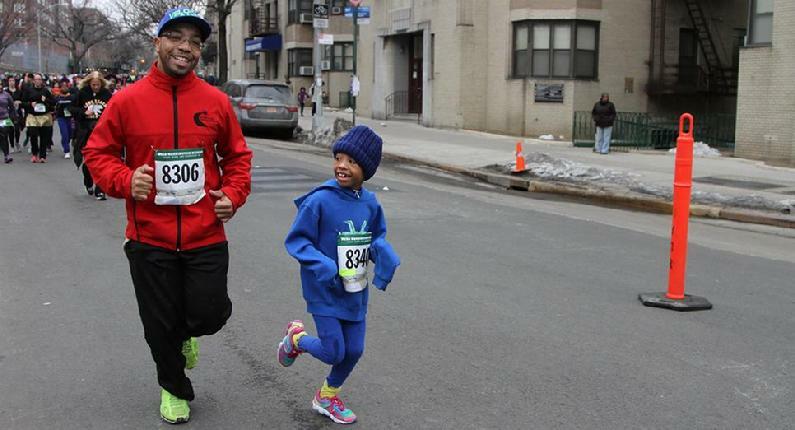 Tiarra Kendall (7 years old) completed the 5K, with her father running with her, in 36:44. This was her 1st 5K run and she amazed everyone by finishing the race. 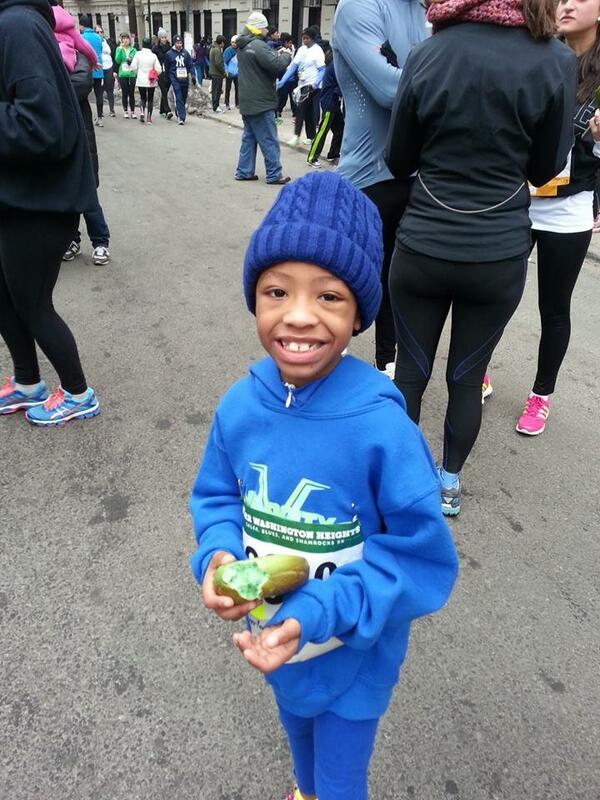 Dontae Lindo ran an outstanding time of 26.39 in the 5K race for an 8 years old boy. He took 2nd for boys 8 & under and then won his heat in the 7- 9 age division 300 meter race. This was a great event to expose our children to. The distance was challenging, but their training prep them for the task. 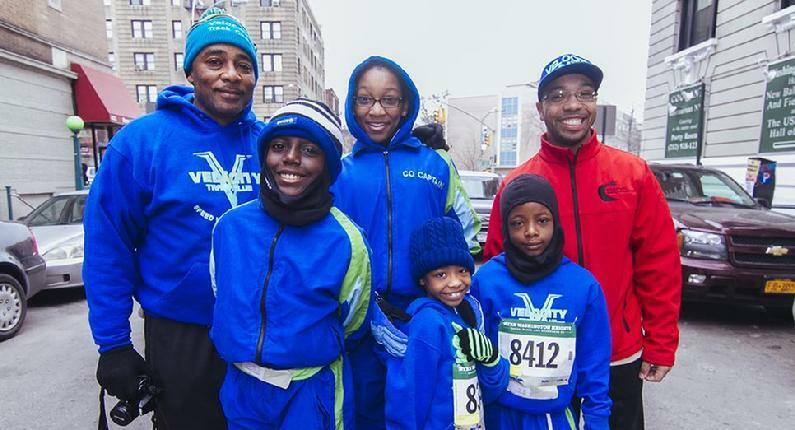 They had the opportunity to meet and take pictures with Cliff Sperber, NYRR Vice President of Youth & Community Service, New York Congressional Representative Charles B. Rangel and Sid Howard (75 years young) World Masters Athletes Champion in Budapest. 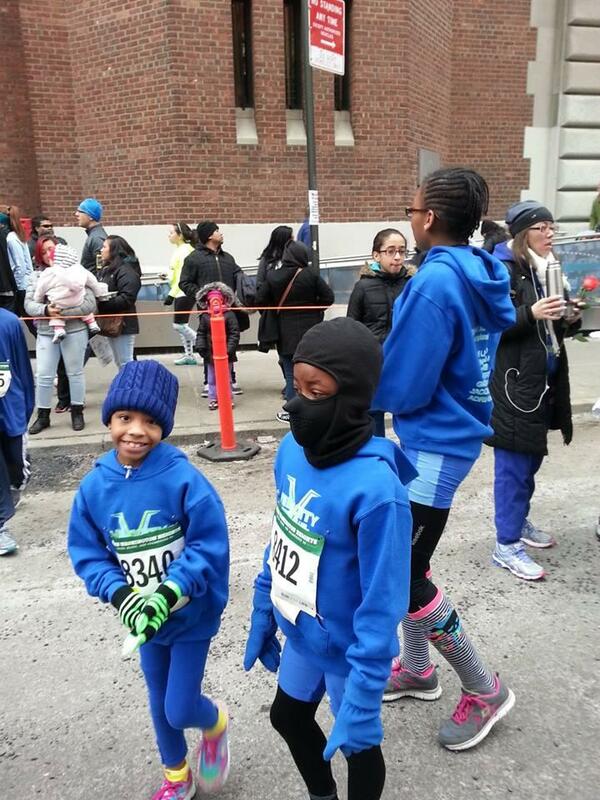 Our young runner know how to bundle up. I see Tiarra at the finish line and here comes Kendell.